The first major rain of 2018 caused widespread flooding in practically every Rio Grande Valley city last week. Although the sun shone on and off on Tuesday, the hopes of a better day were overpowered as more showers were descending into the region later in the day. 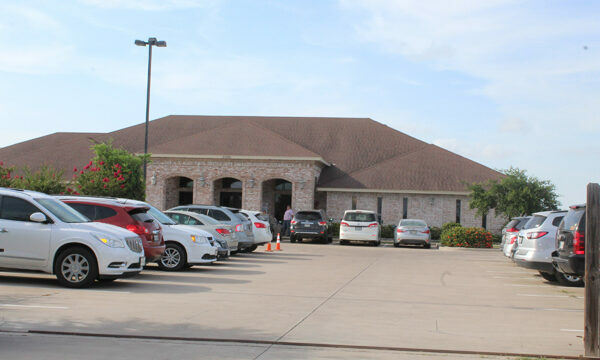 According to an American Red Cross spokeswoman, more than 20 people from Los Fresnos sought refuge at the emergency shelter, or dome, on FM 803 while 94 people in Donna and more than 100 in Weslaco did the same. 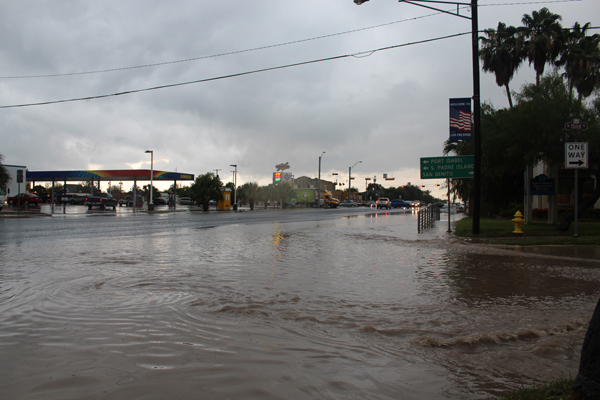 More than a foot of precipitation rain fell in the Weslaco area on Tuesday, June 19, filling streets with water and leaving many vehicles stalled. 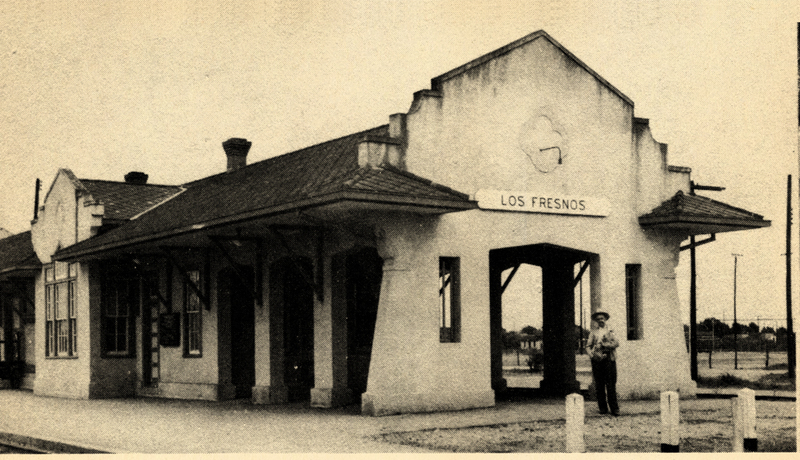 In Los Fresnos, more than 5 inches of rain fell on that day flooding many streets, causing power lines to go down and lightning struck a house sending volunteers fire fighters to the scene. 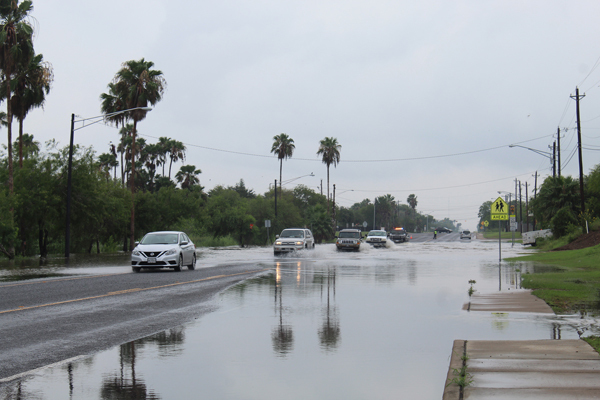 Vehicles going cautiously last Thursday along North Arroyo Boulevard as resaca waters went over the road. The city’s Canal Street became a real canal as plastic trash cans and debris could be seen floating as the objects came down from Jacklyn Street. Water was about to go into several houses along Canal Street and cars were stalled on Nogal Street which had to be closed for several hours on Tuesday, June 19. A Resaca about a block north of Resaca Drive went over its bank on North Arroyo Boulevard and traffic was directed to form a single line as the waters were over the road on Thursday. Water flowing from Third Street to North Arroyo Boulevard. 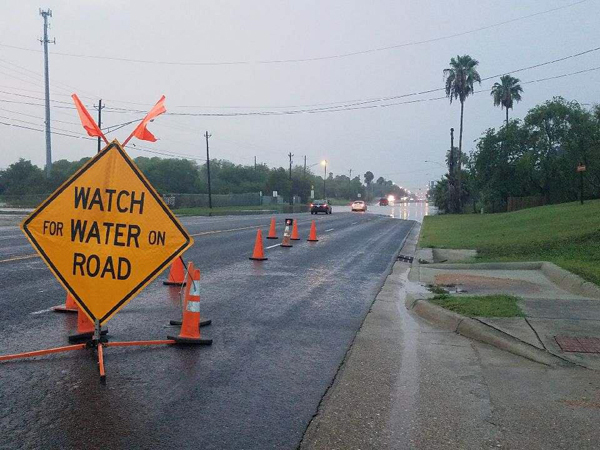 Los Fresnos resident Claudia Ibarra and Carlos Salazar, the city’s public works director, said they have not seen so much rain fall in quite a while. Third Street, or the road in front of the fire department/Emergency Medical Service building, also flooded last Tuesday. According to the National Weather Service in Brownsville, more than 6 inches of water fell in Los Fresnos over a three-day period last week and more than 8 inches of rain was recorded in La Feria on Tuesday. 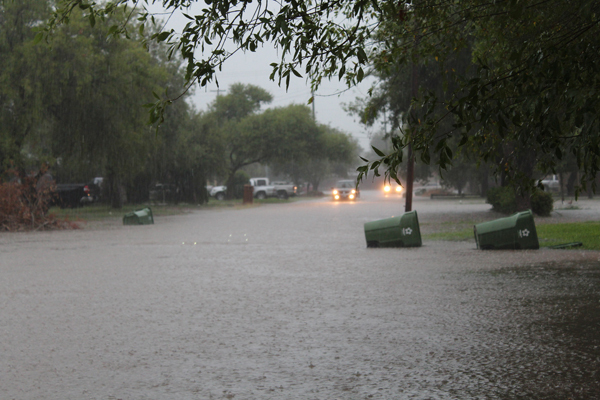 Estimates indicate that more than a foot of water fell in Weslaco. Another area pounded by the rain was Port Mansfield in eastern Willacy County where a vessel was reportedly sinking at the harbor after taking on so much water. The deluge was caused by an area of low pressure and deep moisture coming from the Gulf of Mexico, Jason Straub, a NWS meteorologist said. Tim Speece, another NWS forecaster, said the area was expected to get a break just in time for the weekend. Canal Street during Tuesday downpour.